A lugubrious memoir by a woman who, through psychoanalysis, came to understand how her self-image had been shaped by childhood yearnings for a normal family life—complete with a strong, protective father and a stable, caring mother. 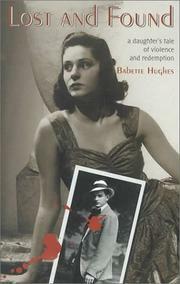 Hughes was only two when her father, a bootlegger, was slain by the Cleveland Mafia. Her mercurial, often hysterical, and frequently bewildered mother (a decidedly unmaternal woman so neglected by her own mother that she was raised in an orphanage) told her that her father had died of pneumonia. While fantasizing that her father was up in heaven keeping an eye on her, Hughes learned to become her own parent, looking after her mother as she longed for her mother to look after her. At 12, her older brother told her the truth about her father's violent death, and newspapers at the public library filled in the sordid details. Anxious to get away from her mother, she got married while still in her teens—to a young man who seemed to offer an escape. Interspersed with chapters about her miserable childhood and her marriage to a domineering husband are her account of sessions with her psychoanalyst: "I ride the analyst's couch and see the murders and my unparented childhood from the safety of that room. . . . I weep for the first time at all my losses." In the long process of analysis, Hughes is able to replace her imaginary father with a realistic assessment of a flawed human being, to forgive her mother for her blighted childhood, to understand what was keeping her in her unhappy marriage, and finally to start a new life. A minor addition to the literature of dysfunctional families and the damage that parents can do to their children's psyches, this woe-is-me tale with an upbeat ending has little to recommend it.